In 1923 the Marine Transport Workers Industrial Untion 510, a branch of the Industrial Workers of the World (IWW), called a strike that immobilized 90 ships here in San Pedro. The union protested low wages, bad working conditions, and the imprisonment of union activists under California's criminal syndicalism law. 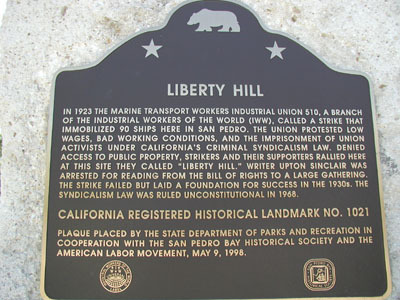 Denied access to public property, strikers and their supporters rallied here at this site they called "Liberty Hill." Writer Upton Sinclair was arrested for reading from the Bill of Rights to a large gathering. The strike failed but laid a foundation for success in the 1930s. The syndicalism law was ruled unconstitutional in 1968. 5th Street, approx. 100 yard W of Harbor Blvd, San Pedro.